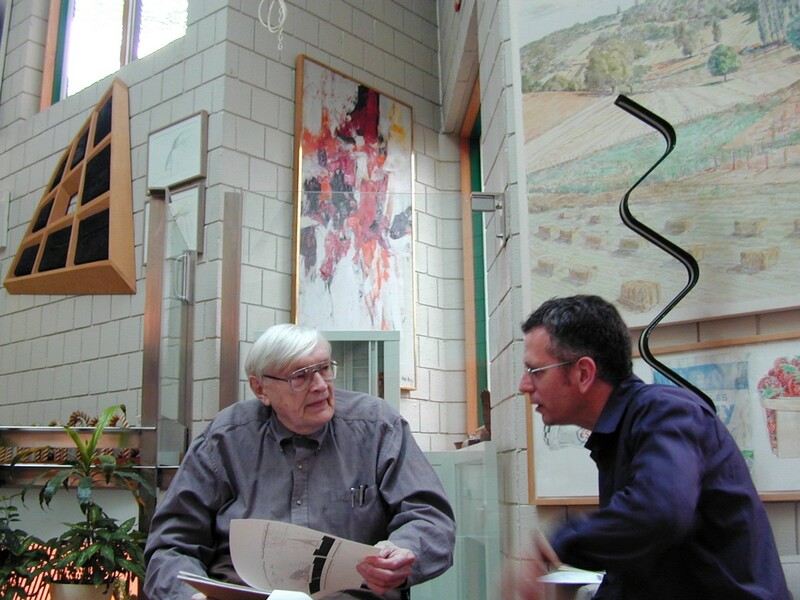 The following is an interview between two influential figures who made a great impact on the design profession during their lifetimes: Walter Netsch and Detlef Mertins. 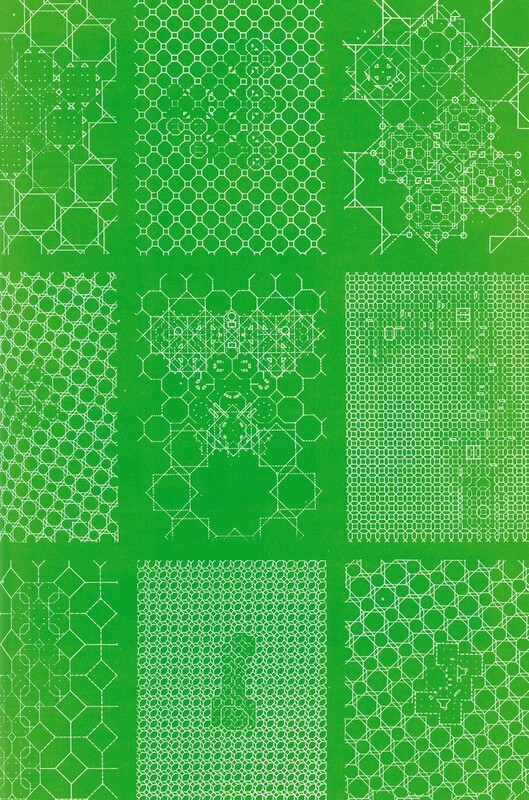 Published in 2001, the story appeared in SOM Journal 1, the first edition in an ongoing book series that highlights the conceptual undercurrents being developed at Skidmore, Owings & Merrill, one of the leading architecture, interior design, engineering, and urban planning firms in the world. The introduction has been updated. Walter Netsch was born on February 23, 1920, in Chicago and passed away on June 15, 2008. 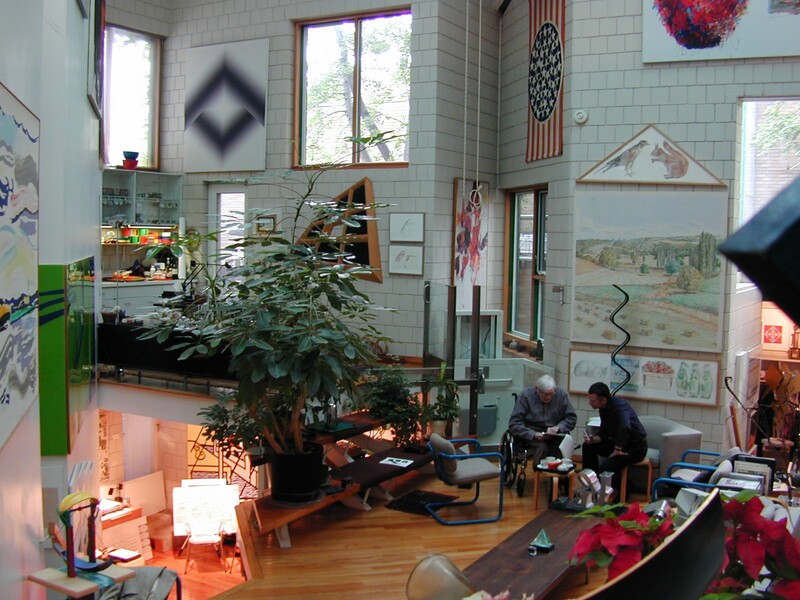 He studied architecture at the Massachusetts Institute of Technology, graduating in 1943. After several years of service in the U.S. Army Corps of Engineers, he worked with the architect L. Morgan Yost in 1946–47 and then joined Skidmore, Owings & Merrill, first in the San Francisco office (1947–51) and then in Chicago (1951–79) where he became partner in 1951. 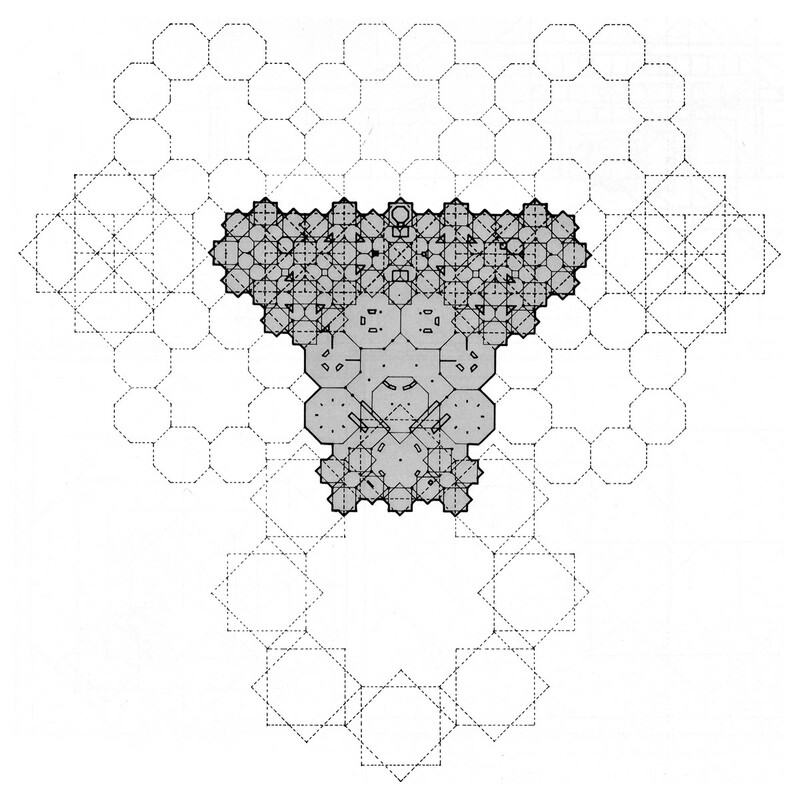 Netsch established a distinctive approach to design using what he called “field theory,” a highly versatile approach to the geometric generation of architectonic structures intended to be uniquely suited to their purposes and environments. 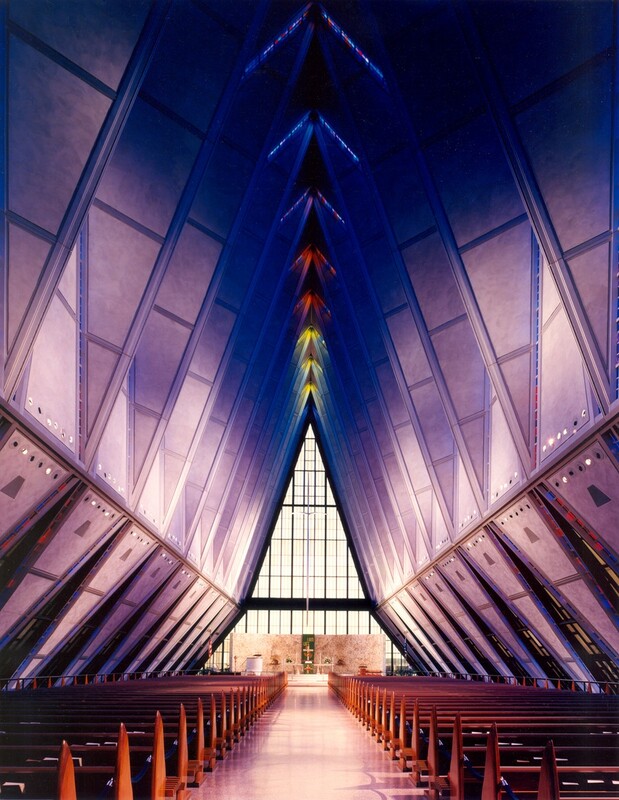 His major works include the U.S. Air Force Academy Cadet Chapel in Colorado Springs, Colorado, completed in 1962; the University of Illinois at Chicago Behavioral Sciences Building, completed in 1969; and the Miami University Art Museum in Oxford, Ohio, completed in 1979. He received honorary doctorates from Lawrence University, Miami University, Northwestern University, and Purdue University. His work has been exhibited at the Colorado Springs Art Museum, the Miami University Art Museum, the Museum of Modern Art in New York, and the Museum of Contemporary Art in Chicago. Detlef Mertins was born on October 14, 1954, in Stuttgart, Germany, and died on January 13, 2011, in New York City. He wrote extensively on the history of modernism in the 20th century, including a monograph on Mies van Der Rohe and exhibition essays for the Museum of Modern Art, the Canadian Center for Architecture, and the Whitney Museum of American Art. He was Professor of Architecture and Chair of the Department of Architecture at the University of Pennsylvania School of Design. 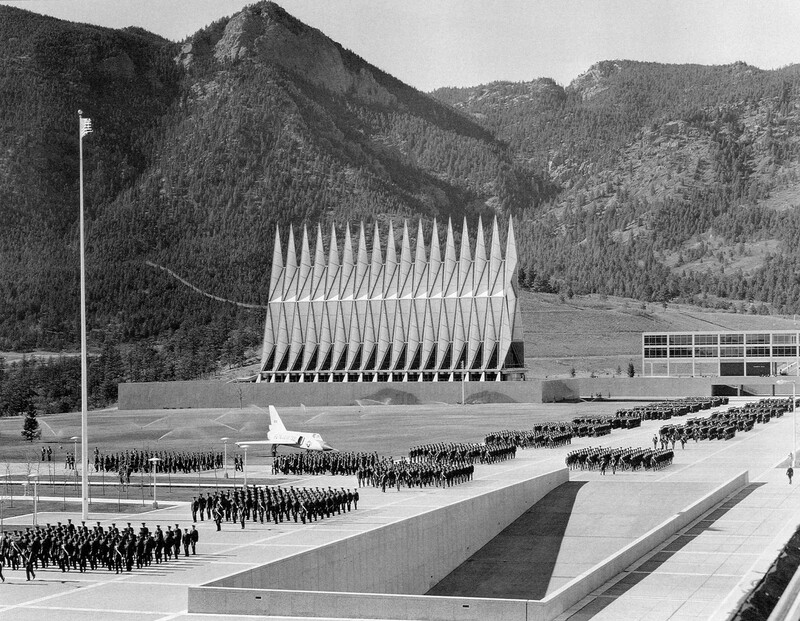 Detlef Mertins: The United States Air Force Academy in Colorado Springs has been recognized as one of the most distinguished projects of SOM and, more broadly, of modern architecture in America. 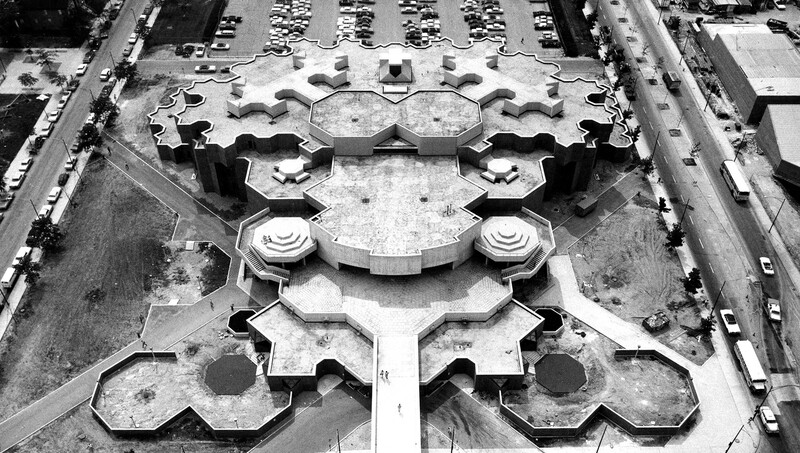 The architects were selected in 1954, and the Academy was opened in 1958. The Chapel was completed in 1962. 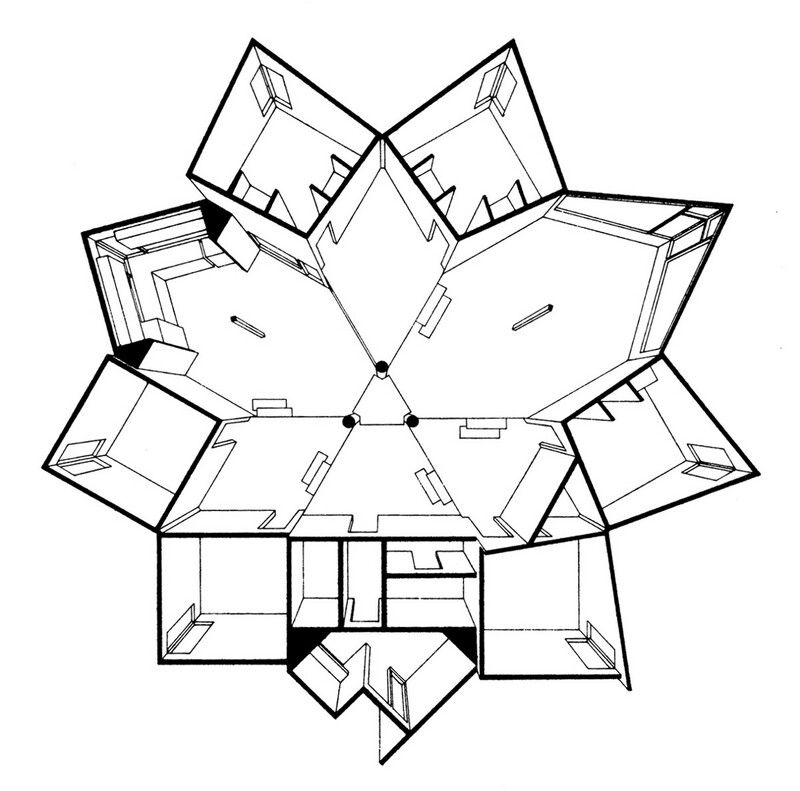 The project received the American Institute of Architects 25 Year Award in 1982. As a young man, how did you get to work on it, and what was your relationship with Gordon Bunshaft? Walter Netsch: I was given the full responsibility for the design of the Academy. I was thirty-four years of age. Today you have to be fifty, although there are some younger architects coming up too. Of course, Gordon was the chief of design and came to the client meetings. I wanted him there. I’d find him with his squared paper moving things around for the campus, making refinements, but not major changes. He always credited me with solving the problem of how to build on the mesa. My dorm, which is two levels up and two levels down, really wowed him, because he didn’t think that way. So we got along fine. The only time we didn’t get along was when he suggested the Italian mosaic. I had never been to Europe. But he went whenever he could and had seen the small mosaics from Murano. “That’s what we should use on these walls, Walter,” he said. “Oh,” I said, “fine.” So we got samples and I looked at them. Of course, we had a tradition of using red, blue, and yellow — the Bauhaus colors, which Gordon really stuck to. But I liked green also, so I brought along green. Gordon looked at me for a while and said, “Walter, if you use green I’ll never go to another meeting.” That was the easiest decision to make. I took off the green. I was raised at MIT, but he wasn’t. I was sufficiently younger that I didn’t have that full dedication to the Bauhaus that he had. He was really part of the revolution at the beginning, when America was modernizing. I was at the end of it. DM: Did you run into any other problems on the Academy? WN: The partners didn’t like my chapel on the hill. It was too medieval. And Saarinen said, “I don’t care what it looks like, but Walter, you’ve got to get it off that hill.” He’d speak Finnish, you know. He was born in America, but would always go into a foreign language, and the words would come out marvelously. He used his hands and said, “Bring it down into the life of the cadets.” Of course he was right, and it moved down, although very slowly. I often had a hard time because once we’d thought something through, we thought that it didn’t need to be reviewed again. There were times when it was proper to review, times when it was not. But Gordon would take the academic building, and he would suddenly start pushing elements around just for the sake of a Corbusian proportional system. I had a system too, based on the number seven. Three-and-a-half and seven. The whole Academy is based on the seven-foot module. I had lived in Japan and appreciated how the module of the tatami mat worked. But Americans are taller than they are, so I had to figure out a dimension that was appropriate. I picked three-and-a-half and seven. If you look at the Academy horizontally, vertically, within, everything is on that module… Oh, it was a job to make it work rationally, but we did it. DM: If you were accustomed to working with a rectangular module, how did you come to use the tetrahedron for the chapel? WN: That was Ken Nasland’s contribution, my engineer. We would have lunch at a beanery across the street and scribble while we talked. I was really worried because Gordon had sent me to Europe to look at Gothic architecture and Renaissance architecture. “Because you’re going to do another controversial building, Walter, and you’ve got to be able to say that you’ve seen Chartres and Notre Dame.” The trip took three weeks. I came back saying, “Gee, we don’t have stone masons today. We don’t have the love of labor through which something is added within the same vocabulary every decade. How can you achieve that effect, but do it all at once?” We made a little model of a folded plate, which was au courant. Take a piece of paper and bend it, and so forth. Origami. I started scribbling, drawing, trying to get a repetitive feature. Ken said, “What are you doing? Trying to draw a tetrahedron?” That’s the way he talked. Very straight forward. I said, “No. What’s a tetrahedron?” He drew me an equal tetrahedron. But I said that wouldn’t work. “Well, make one of your own,” he said. So I went home and got the tetrahedron to work. I worked as much at night as I did in the daytime. I got it to flip-flop. That was the great thing. I could flip-flop it, turn it upside down, inside out. Then I made a model to show to Nat [Nathaniel A. Owings] and Gordon. It was of two tetrahedrons and was about three feet tall. Of course Bruce Graham saw it in the office and asked, “What are you doing?” I said, “I’m working on the chapel.” Nothing else happened. He went to Bill Hartman and said, “Walt is crazy. He’s got an idea that’s just awful.” And then I took it to Nat who said, “Gee, that’s wonderful.” I took it to Gordon and he said, “You should pursue it.” Bruce went to Gordon and said, “Will you stop it?” Gordon said, “No, I won’t.” So there was a conflict within the firm as well as outside the firm. DM: Were these people part of the studio? DM: Dedicated to doing research? WN: Yes, but I didn’t get any approval. I just did it. Just four guys who concentrated on research — research on glass, research on aluminum, research on whatever was needed. As long as it was for the good of the project no one complained. The glass strips were only a foot in width, so I couldn’t very well tell a story as Gothic stained glass had done. It had to simply work with colors. I went for dark colors at the beginning, symbolizing the creation of the world, shifting gradually to gold at the altar, for the revelation. Robinson came up with the technique. 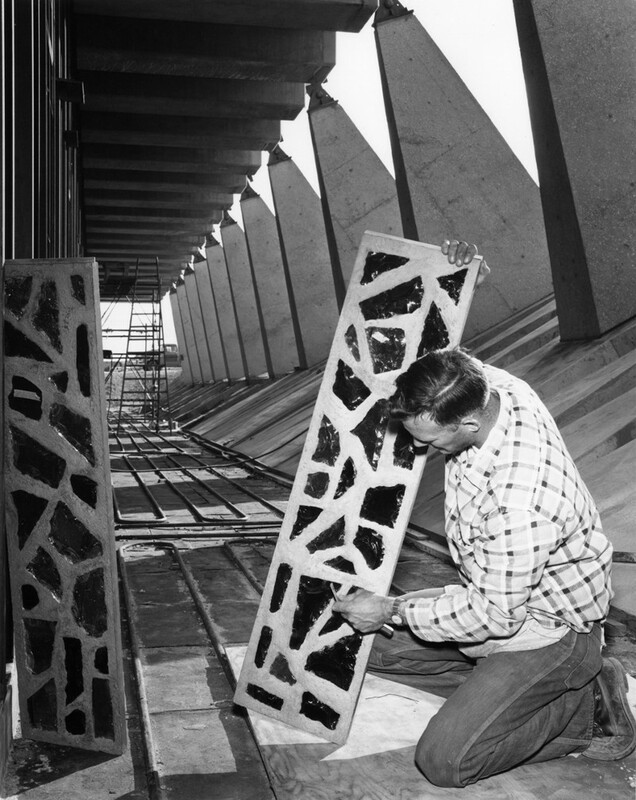 He said, “Walter, you just take the workers and tell them to hit the edges with a hammer.” The raised cushion would then fasten in different ways because the glass reacted differently to the way in which different people hit it. No one was trying to copy the old craft techniques of the Gothic cathedrals. “Just hit it. You’ve got a whole crate of them, hit them.” And it worked. It is faceted and it looks great when the sunlight shines on it. DM: It seems that, already then, you were able to achieve a fair bit of autonomy within the firm. WN: Yes, and at the same time I was really in favor of working as a group. First of all, I had to concede that I could do it. Somehow I could do it. So I really wasn’t worried about being in the group. That wasn’t really a problem. Secondly, we were working on large projects, so there was an individual project within the group that you could take responsibility for. And then you had Nat. The partners’ meetings were wonderful at that time. Gordon, of course, had established the name of the firm. All those project managers in New York, bless them — I mean, Fred Kraft, Ed Petrazzio, Bill Brown, and the rest of them — felt that Gordon took all the glory. No one got any credit in the magazines for any of the buildings until the Academy Chapel. Since half the partnership didn’t want it built, they were very happy to let me take all the credit for designing it. So I broke a taboo by accident. DM: Before we talk more about how you broke away from the mold within SOM, what would you say you took from the more orthodox modernist approach? WN: I’m really the last contact from the old days at SOM. 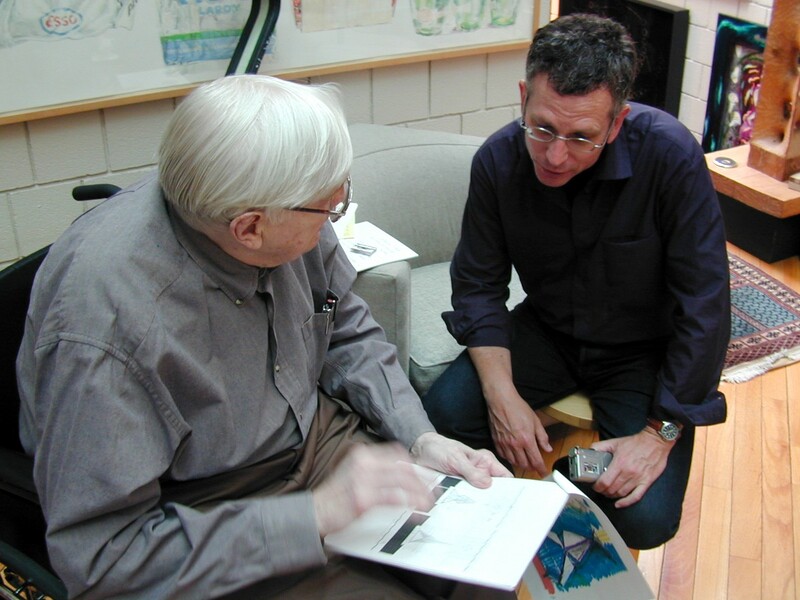 Bruce came after me by enough years that he caught the Mies bug, and John Barney Rogers, a partner in the firm in the beginning, went to school in the Bauhaus in Germany under Mies, spoke German. He was my boss when I was the designer out in the San Francisco office. I lived in a little one room apartment with a view and a spring-down bed. When he went on vacation, he gave me the keys to his wonderful house in Pacific Heights, multileveled and looking out over Golden Gate Bridge. He had a library from Germany and chairs from Germany, tufted sofas and things. I’d take my vacation at the same time he did, and I’d go up there and see these elegant books. I was recently given an award at IIT, and I gave credit to Professor Anderson of MIT, to Gordon, and to John Barney Rogers. 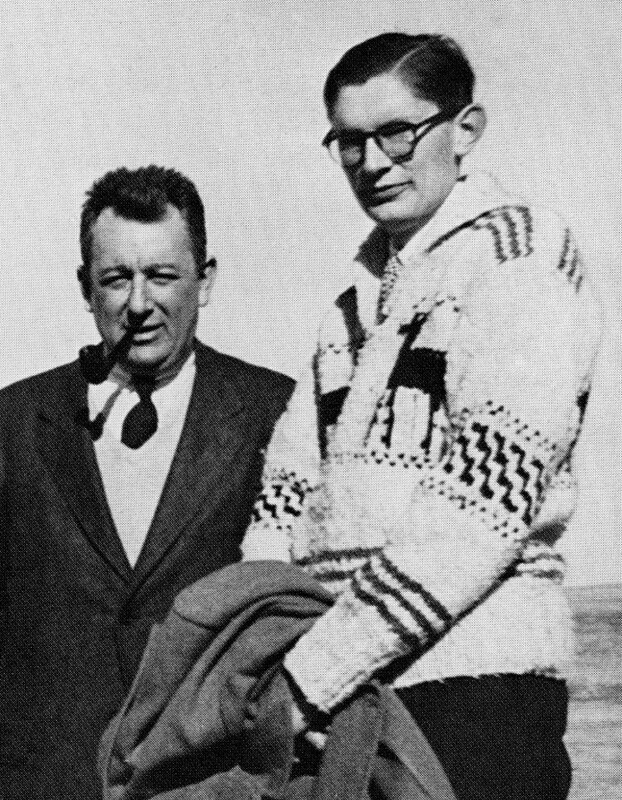 “Walter, this plan doesn’t quite read,” John would say because of his Miesian studies. It reads. You don’t have to look for it. A professional can immediately see how it works. So we all learned that part of modernism that has to do with reading. If you look at work by Le Corbusier or any of the other modernists, it always reads. DM: Is that important to you still? DM: Something you strive for in your work? WN: Yes, even my complicated mathematical ones. I think you ought to have an image. In all my travels abroad I can’t think of any place where chaos has been the design element. I’ve been to Bilbao like everybody else and seen the Guggenheim by Gehry. I think it’s a marvelous building. I really do. But I can’t imagine six of them. DM: You’ve also described yourself in contrast to Mies who had a big influence on SOM. Would you say a bit more about that? WN: I never could be a Mies fan. I just do not have the same basic attitude. The search for an SOM look was Nat’s. Gordon was the closest to it at that time. I never thought of it to speak of. I didn’t go home and think at night of being different. I’d go home at night and think, what are the issues I needed to deal with and why. Working on the campus at the University of Illinois I’d ask, “Why do I have a high-rise building? Because of the program?” We were trying to get the humanities and the social sciences to speak to one another. The president gave me the program. He didn’t want all the departments in little buildings as they had at Urbana. So I devised a high-rise building that had two floors for each discipline with a seminar room in the middle and some offices. The elevators and the heating and ventilating system worked so that any two floors could operate independently on the weekend. We hoped there would be communication. 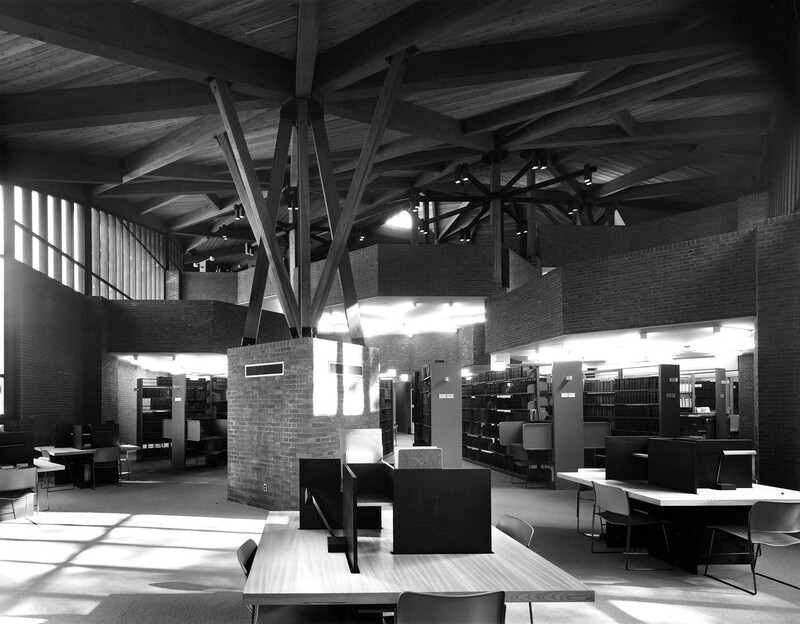 We had a very modern, sixties attitude towards what an urban university should be. We thought it should provide skills and philosophies that would help resolve the urban problem. Of course it didn’t. But the buildings reflected that effort. Detlef Mertins: You start a project, then, by grappling with the task in its fullest sense. Then you look for the right architectural means to use, each time ending up with something quite different. Walter Netsch: Yes, but that’s the MIT program. Professor Anderson was a marvelous man and a very Socratic critic. He would sit down by your drafting table and say, “Walter, why?” And you had to explain why you had done something. It was a Socratic world and a very good world. He was also a good modern architect. We could watch his swimming pool go up and know that we didn’t have to copy him in any way. That was the way I was trained. I’m not a Mies man, you see. I’m an MIT man. We would do things differently at MIT. We would invent things. DM: Can you talk a little bit about invention and experimentation? WN: I just feel that technology is here for us to use and improve. It isn’t a fixed subject. 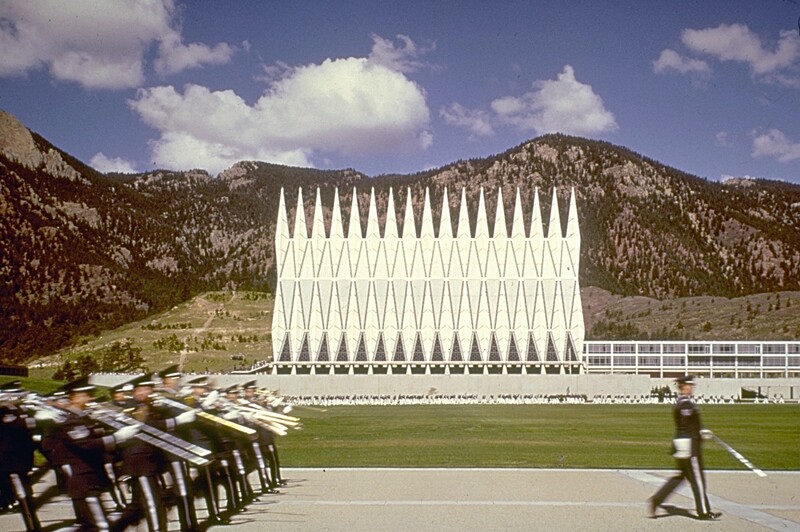 DM: Is it true that mirrored glass was invented for the Air Force Academy? WN: It was. You know, Jack Train, the engineer, and I invented the “finger” system for loading airplanes. Nat was a friend of the head of United Airlines. He asked me to solve the problem of Midway Airport: “How should we load an airplane?” So we did solve it. We had the ramp pull out for boarding and the luggage go on the moving carrier. Jack designed the moving carriages, but we didn’t copyright them. They were used for the airport in Des Moines and at Midway Airport. Of course, things operated at a different scale then. You could drive up, drop your bag, and it would go on out on the finger. You didn’t have the ticket office and so forth. So we’ve been inventive as a firm. DM: You once said that you wanted to enhance the ability of the Air Force cadets to still be individuals in a context where they were being forced to be conformists. DM: Is this a recurring theme for you? WN: It’s my way of life: the individual in a group. I would become very unhappy sometimes. I’d come home and tell Dawn, “I’ve got to leave the firm. I’m just having too much trouble.” And she’d say, “Walter, where are you going to get all that help from Sam Sachs? Where are you going to get the help from Ken Nasland,” who was my engineer. So I learned. I found my clientele in higher education, which of course is not conservative. I was happy and developed my own studio. People would come to work with me because they knew of me. They would come to learn how to think. I didn’t expect them to go out and become little “Netsches.” When I used to hang all the work on the wall, the projects would seem very different from one another, which is more like Saarinen than Skidmore. In fact, that led to criticism from the partners. I didn’t hold a line visually. Not like the box and variations on the box. DM: You also didn’t produce just a single alternative to the box. WN: Well, I looked for one. That’s what field theory was all about. I felt I had to make a contribution. I come from a town in which Sullivan made a contribution and Wright made a contribution. I should have to make a contribution too. Not that I was equal to them, but that was the role they played. DM: Did your field theory develop from the chapel? DM: More than the rest of the Academy? WN: Oh, yes. The Academy was straight out of MIT. DM: How did geometry become so important to you? WN: That came from my trip to Europe, whether it was a Greek temple or a Renaissance building or a Gothic building or an early medieval building. DM: When you saw one of those buildings, did you see its geometry as if you had x-ray vision? DM: How did you come to the word “field”? The designs you’ve been showing us are discrete objects, not field structures. WN: Each one is a different field. There’s a field of daisies, there’s a field of sunflowers, there’s a field of wheat. 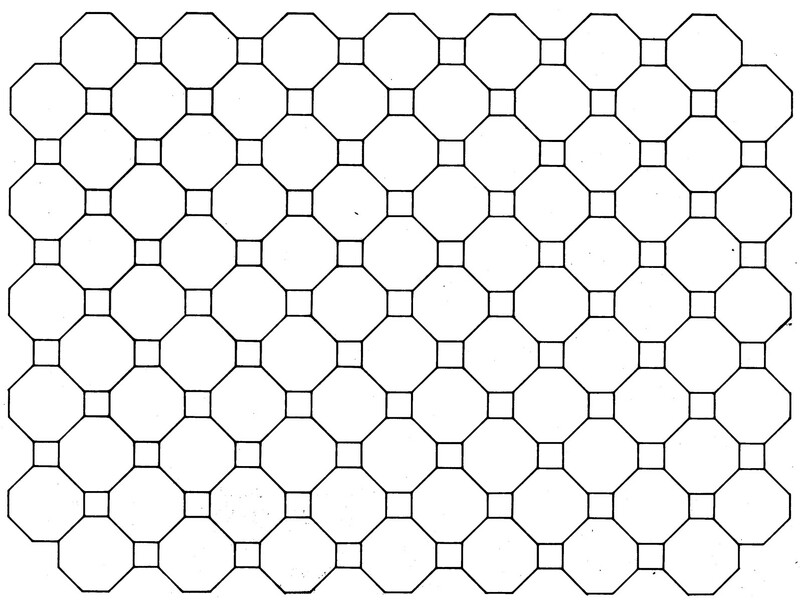 DM: So you see each one of these as a field? WN: Each one can be converted to a field. DM: How would that conversion be made? WN: It would depend on what the design is based on. 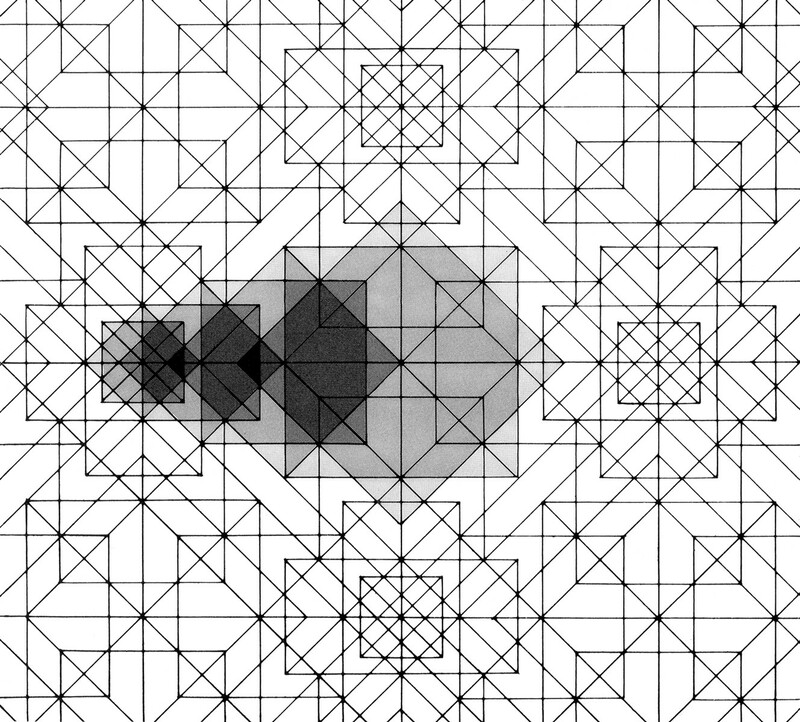 You see how this geometry all connects, all these lines connect. This one is based on a theory of nine, the Hindu number. I grab a number like that. I’m Protestant, so I don’t have a number. DM: Why do you need numbers? WN: We don’t need numbers, I guess. DM: Is the same thing true with geometry? How do you choose whether you’ll start with a tetrahedron or a square or an octagon? WN: The rotated square was the way we broke the box, by rotation. DM: How did you go about make a drawing of that kind? 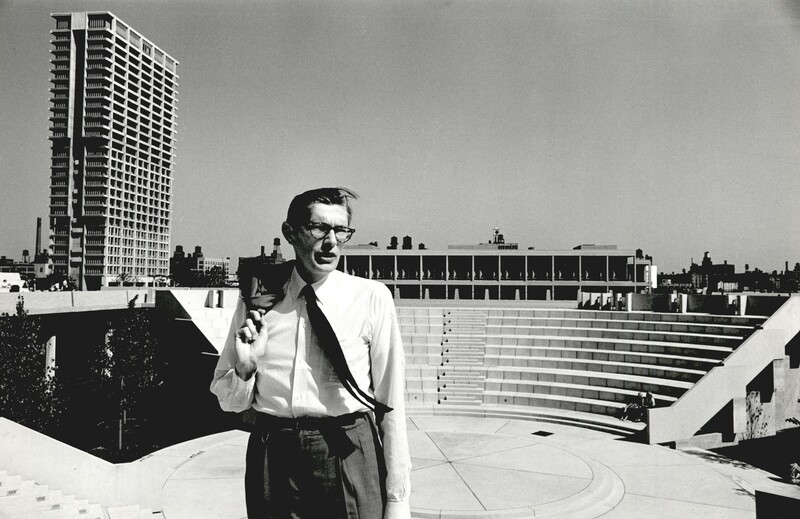 WN: Well, I tell you, Art and Architecture was the first building at UIC. It was a rotated square based around a circle. I made about a hundred drawings to explore that. We just drew them and drew them and drew them. The drawings weren’t for any building at all. They were just drawings. This is an example of a field. 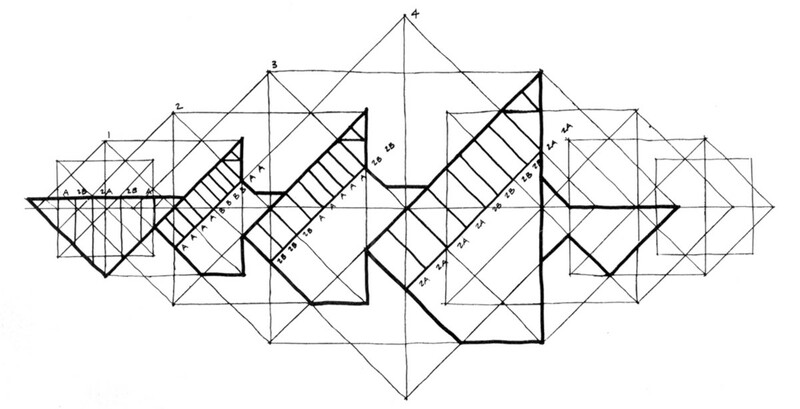 This is a figure, a rotating square is the figure of the field. They reduced in size mathematically, so that this one is equal to a half of the first, then a quarter, and this one. I borrowed the idea from a design by somebody in 2000 B.C. I didn’t invent it. You see it makes a circle. You could use pieces of it. There’s the whole one. And it’s a very nice form to make changes with. It has change built into it. The rotated square is a fixed figure, while this is a floating figure. I used this a lot now, because I prefer the floating figure. Spaces float. 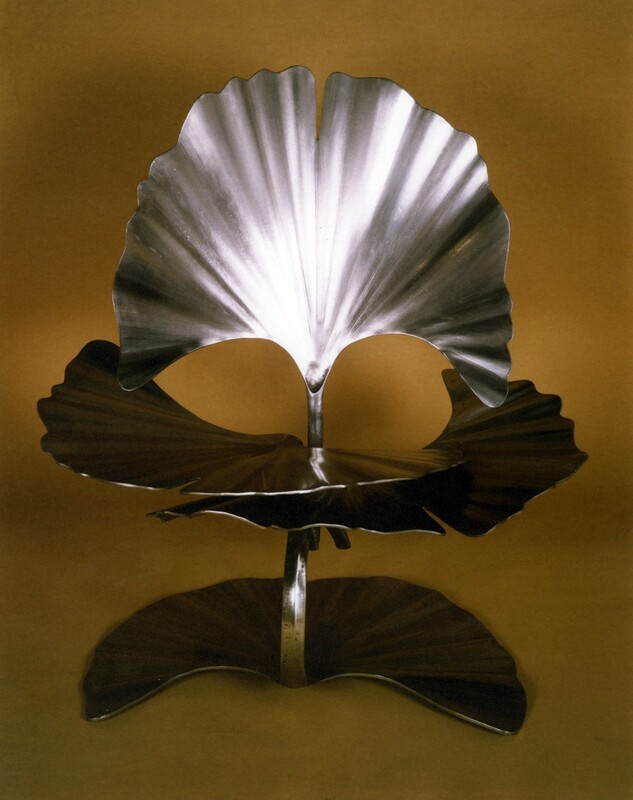 Did you see my ginkgo leaf chair? You can sit on it and have a drink on one side and a book on the other. That’s the idea. 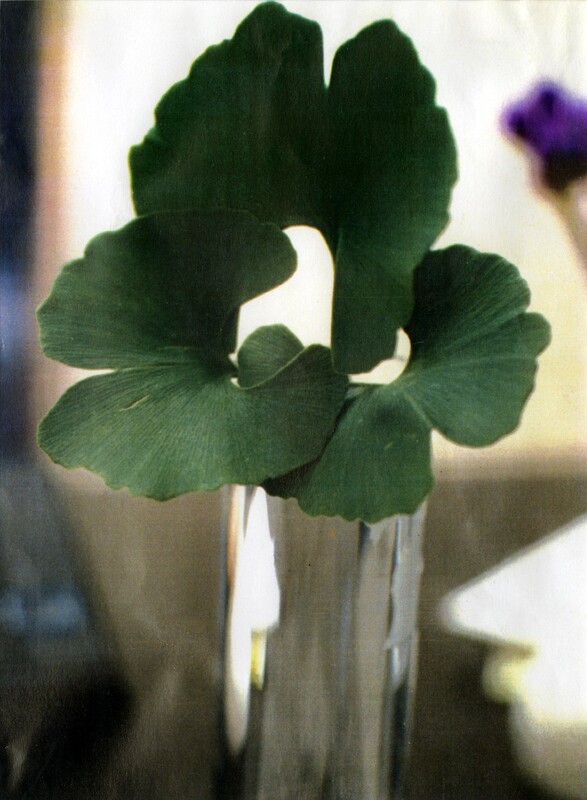 DM: Why did you choose a ginkgo leaf? WN: I did it just because of my excursion in Japan. I fell in love with a ginkgo tree. This is an apartment building that uses the same geometry. There it is and combined to make a field. Now this is where the figure has become a field. DM: It’s almost like a tissue. WN: That’s right. We flip-flopped the field and the figure. That forms the pattern as it goes up. We just exchanged that geometry for this geometry. You see? The big pieces and the little pieces. DM: What’s this one called? WN: This is the chrysanthemum field, named after the flower of Japan, because I was doing a library for Sophia University using that and I wanted a word to communicate a love of Japan. It was the first time I did a linear core and the field went around the edge. The linear core was the book collection. DM: Do you set up the geometry first and then somehow adapt it to the uses that the building is intended to for? WN: No, I have that in the back of my mind as a goal. And I fiddle around until I get a geometry I know will work. DM: Why do some of the projects have a very strong center while others don’t? WN: That comes from the program. DM: How is the field theory different from working with a module? WN: It uses a unit. A module is small scale and you repeat it. This is a field, a figure instead of a field. That’s the figure out of the field. And this is a larger complex of figures that make a larger field. DM: When it comes to turning the design into three dimensions, what do you think about? WN: This is extruded, obviously. The whole chrysanthemum is working at the ground level, but then it disappears halfway in the roof. And then this other element intrudes. DM: Your own house isn’t an extrusion? WN: No, it is not. DM: It has so many shifting levels. WN: Well, again, that comes from the program. I wanted to have one big space with no corners in the house. But I wanted to define the spaces. I could define them by levels — the living level, dining level, private bedroom level, with a little piece of the dining room coming into the living room. DM: You respond to each individual situation. WN: I’m just being like Wright. Because I do these variations within the scheme. I’m not interested in repeating anything if I can possibly avoid it. I can’t claim Wright, of course. That would be conceited of me. DM: How does your approach differ from Wright? WN: I’ve looked at his plans since I was a kid. I went to the Robie House and the Blossom House. I can see the difference between the Blossom House and the Robie House. DM: Sounds like you’re thinking about variation. DM: Is there a system involved at all? WN: Unlike Gehry who has to do a different image each time, I am trying to work within the sense of figures and trying to develop a holistic relationship. That’s all that I’m interested in doing. 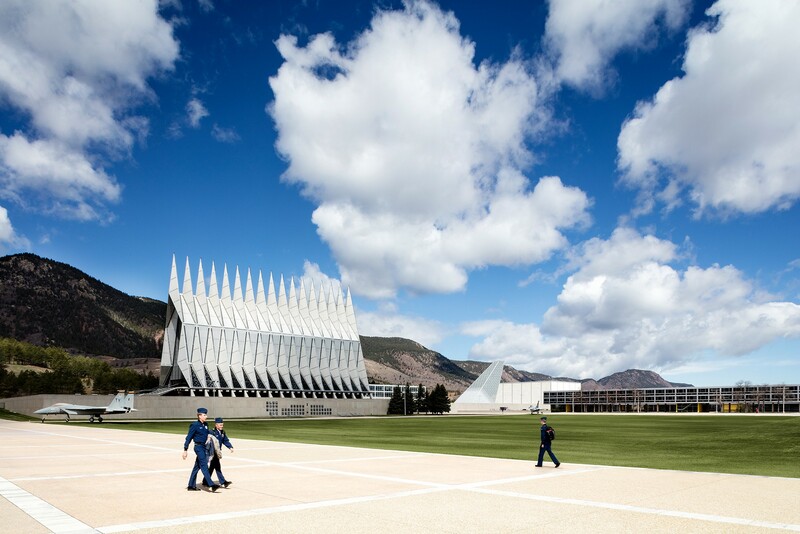 I didn’t want to do another Air Force Academy. Never. It was fine. I did it. I worked like hell. It’s a beautiful thing. It fits the setting. Fine. 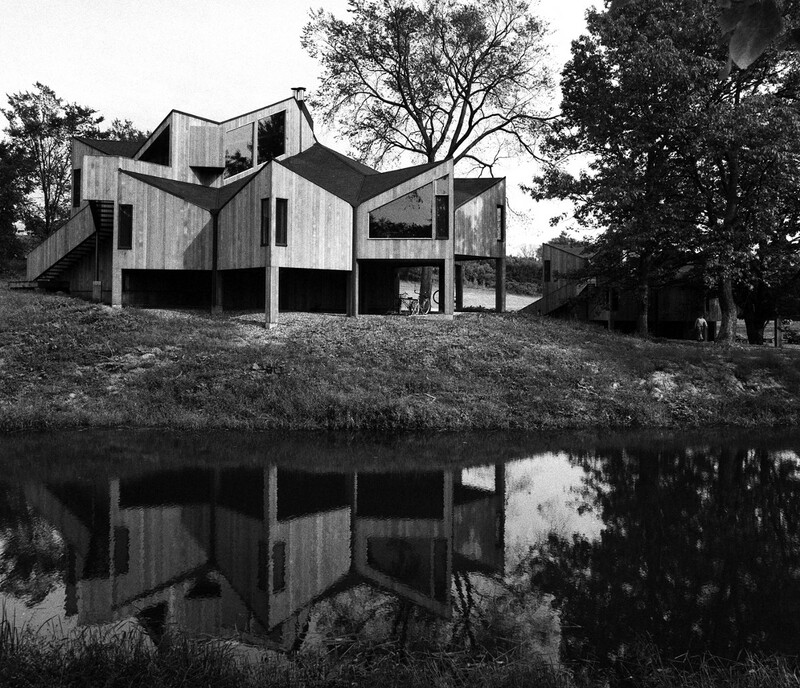 DM: Some of your buildings remind me of Louis Kahn’s work. WN: Lou was part of my life. 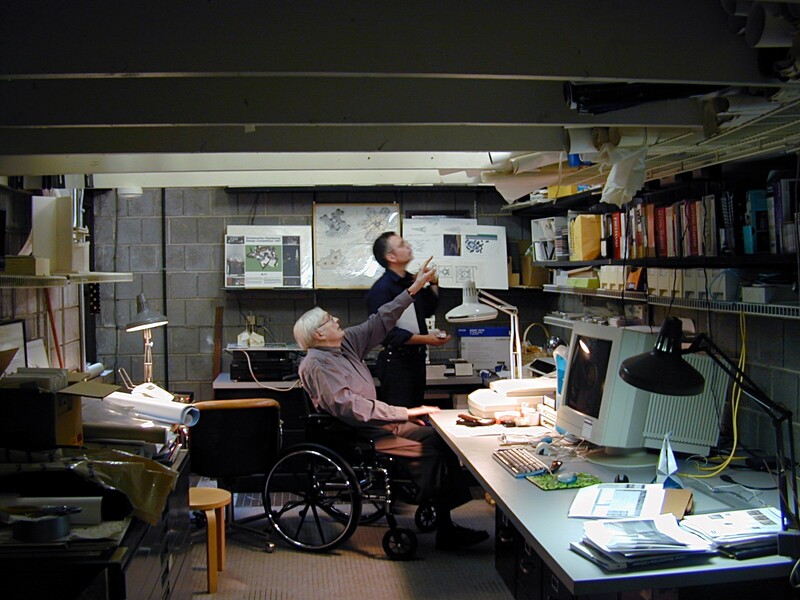 Lou and Bucky Fuller were two of my idols at the time. DM: That’s quite a combination. WN: Yes, they are quite a combination. I knew Bucky from college. He’d give those three-hour, four- or five-hour lectures, and you had to sit there. We almost lost the Air Force Academy over Bucky. We didn’t want to destroy the land by putting all the little houses in. So we said, let’s do a Bucky by lifting everything off the ground. We’d design a cluster, which gave us a small field where we didn’t have to grade, we didn’t have to touch anything. And we had a tower that cantilevered out letting you park under it and use it like a porch. But the Air Force people just revolted. 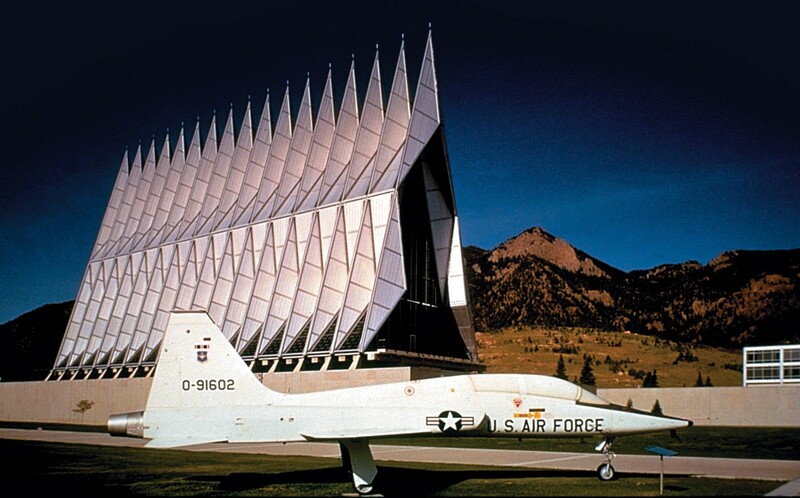 “You can have your modern Air Force Academy,” they would say, “but I want my house to look just like it looked back home.” So we almost got fired. They hired an architect from Omaha who did those kind of houses, and we worked with him to trim our houses up a little bit. But they had a flat roof. And we still tried to follow our site plan, but by the time they got through, the land was graded to hell. It was not what we wanted. To me that was a major loss in planning. I was asked about a year ago [The year 2000] to set criteria for an addition to the Academy. I said that people should work within the discipline of the Academy. Not copy it, but do something within the discipline. I thought that the chapel would be a good thing to deal with since there are now more religions that need to be all in the same building. I decided to work with the tetrahedron, to deconstruct it, and made many variations. This one is an imaginary tetrahedron on the outside. From the inside, it’s scooped out, so you see it as an event. I made model after model after model. Then we had a show at John David Mooney Studio. Editor’s note, 2/23/17: After Netsch retired, SOM was hired by the Air Force Academy to design an addition to the campus: the Center for Character and Leadership Development. It was completed in 2016. 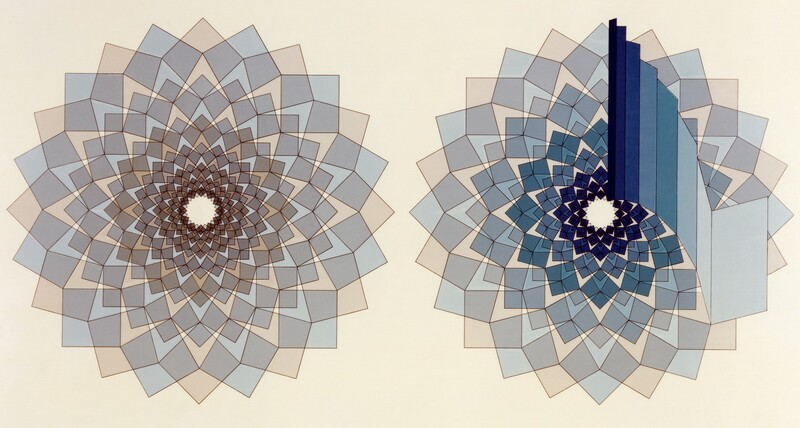 DM: You’ve taken geometries from the chrysanthemum and ginkgo leaves. Why do you look to nature as a source for design? WN: Well, I’ll tell you why. When I was a kid, my grandmother had a home in Lake Winnepesakee, a summer home, and we used to go up there. You wore no shoes and you got into the canoe and you went up and around. I was never an athlete. I guess if I had been an athlete I would be an entirely different person. So I collected leaves. I collected patterns and watched shadows. I wanted to be an artist. And my grandmother and I read; we read books. I became an intellectual early. DM: Did you read D’Arcy Thompson? WN: Oh, absolutely. I can’t put my hand on it right now but it’s here. Oh, yes. It was On Growth and Form, and it was given to me by Bob Engman at Penn, who knew it. He asked, “Walter, have you ever read On Growth and Form?” “No,” I said, “I’ve just looked at it.” So he gave me a copy. DM: What about Gygory Kepes? WN: Well, I didn’t know Kepes. That was way after me. 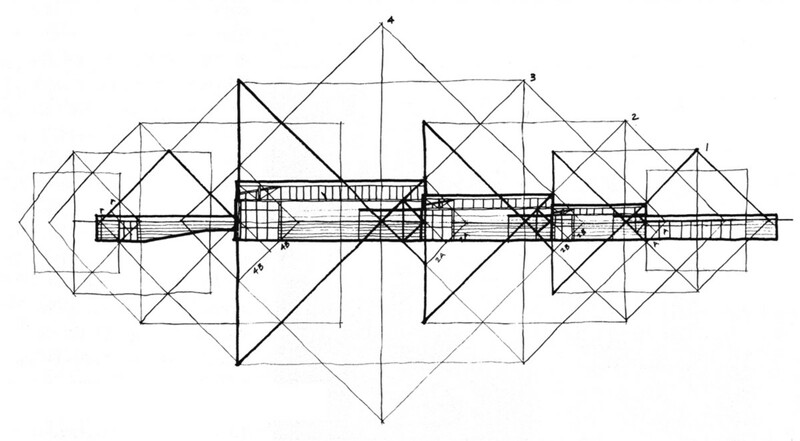 DM: Kepes published a series of books that crossed over between science, technology, mathematics, art, and architecture. One was on structure, for instance. WN: Oh, I’ve got the book. DM: Another was on the module. What did you think of those when they came out? WN: I know, I’ve got all these books. But some I like and some I don’t. They’re part of my language, you might say. DM: Do any of the people you used to work with still work with field theory? WN: No. It’s too much hard work. I mean, you keep asking these questions. You have no idea what decision making involves. It’s just hard work. 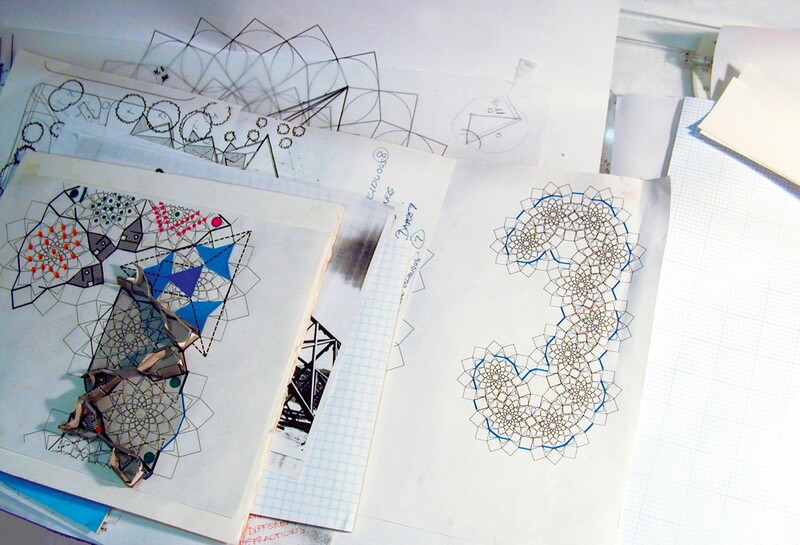 I would sit there and do hundreds and hundreds of little patterns. Now I can do them on the computer, but before I used a compass and ruler, and then the copy machine. DM: How did the technique of overlays work? What did that produce? WN: Well, I was trying to break with the right angle. We did some studies on the rotated square in which they were not at right angles. Sixty degrees, thirty degrees. To see how that nested to make a field. Actually it did something very interesting. It left a void occasionally, which is of course chaos theory. DM: Did you enjoy the way in which the field method could produce something unexpected? WN: Oh yes. The studio would get all excited. DM: What’s the best building you’ve ever done? WN: The library at Wells College. It’s about to be torn down. [The library was not demolished and still exists today.] I wanted to work with the environment, so I made it fit the site. In fact, the first design fit the site so well that I had to do the roof over again. I went to a meeting of trustees and was so excited when I explained that students could ski down the roof of this building. Afterward, the president said, “Walter, you better change the roof. The trustees were scared to death that the students will actually do that.” So I changed the geometry, but it’s still a very good building. It also fit the concept of what a library should be — a place where you study, put the book on the floor, and read on the floor or on pillows. It’s not regimented. It has volume, it has space and perception. It has small rooms that you can go to, especially on the bridge. And it has native materials. It has brick and wood. So I felt it did all those things, plus. It’s the first time we took three rotated squares and made them work together as a triad. 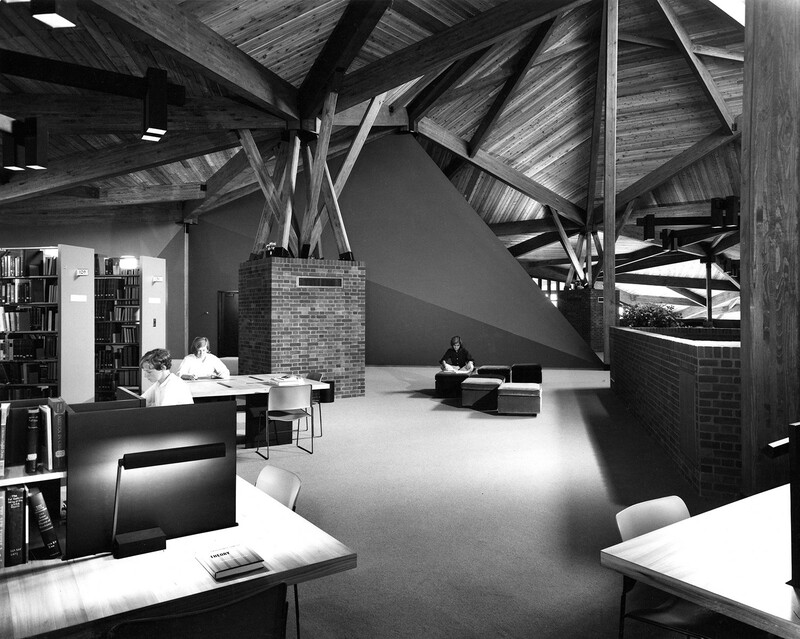 The design of the library is different than any other field theory building because it’s based on that triad. DM: How did you get into collecting art? WN: Gordon taught me to go to art galleries when we were working on the Air Force Academy. Gordon took me around to all the marvelous, very fancy galleries. He has a very fine collection, and he could afford it. He took me around, and the first thing he did was to march through the gallery and move gradually, very carefully — seeing what was on exhibit — into the back room. And he’d sit down, pull out his pipe, and say to the gallery director, who was there of course, “What’s good today?” And they would haul out the Picassos, the Mirós and the Dubuffets, and the things that he liked. I would go around with him on Saturday after we had the meetings on the Academy. Later I would go on visual binges myself, after I got a bonus, and I’d spend twice what I had, hoping that another bonus would make up for it later. DM: What was the first piece of art you ever bought? WN: The first piece was a Motherwell. DM: When you select a work, what do you look for? WN: I don’t look for field theory. I’ve been interested in Lichtenstein since we bought Black Flowers from his first show. I was in New York on one of my visual drunks, and the show was just coming down. It was the first benday dot painting that had been hand dyed. It was not mechanized. It was six hundred dollars. I bought it, took it home. I really loved it because of the contrast between the geometry of the background and the vase and the flowers. Kind of angry. Lichtenstein was a radical painter really. People don’t realize it. They just think, “Oh, he does the funnies.” That’s not really true. I admire the way he works. The paintbrush. The Abstract Expressionists were hot, so he did brushstrokes that play on Abstract Expressionism. When Monet’s A Day In the Country was traveling around, he did a series of takeoffs. Sometimes I buy a painting if I see a relation to the whole history of art, which I think is important, just like it is in architecture. Lichtenstein extends A Day In the Country to the modern style. I don’t have to have a Monet, I have a Lichtenstein. It satisfies my desire. It’s a good painting too. DM: You said once that you thought that art works opened the mind. Can you say more about that? WN: Well, I think I’ve been explaining that. I mean, there’s a relationship between A Day in the Country and the whole of Impressionist painting. Here’s a modern painter who does an Impressionist painter. I appreciate the fact that a modern artist today is not just denying the past. He’s really doing the same thing I’m doing. He’s working and exploring and expanding on Monet. Notice that the benday dots have disappeared. Now there are some stripes there. DM: What should the firm be doing today that it might not be doing? WN: Today it’s as important to talk together as it was before, to establish a dialogue around real issues. Today’s problem isn’t breaking out of the box, it’s blob theory. It’s really three-dimensional geometry theory. It’s tension theory. It’s art theory. The Gehry art buildings. You can sit down and have a great session about these theories. How should they work within the firm? What do the partners think about them? What are the theories we want to project? It may not be one theory, but you may want to refine the different directions. Now I don’t know if the firm is doing blob theory. I could hardly get them to do a field theory building. Actually, I have some thoughts on field theory and the blob. How would I do a blob building in field theory? In a way, they flow into each other. The Moebius strip that has no beginning and no end. But Gordon and I would also talk about paintings. You can also develop the dialogue around art or music. I can list three, four, five composers from the 1950s and 1960s that I think are good. I like to play them with Chopin and go back to Ravel. Ravel is a traditionalist, but he did do some experimenting . So I’m interested in that. Music and art were all a part of my life and I brought them into the studio. I feel that the profession is losing its relation to culture in general and to its own culture. Walter Netsch died on June 15, 2008. He was 88 years old and is fondly remembered by all of us at SOM. His interviewer for this story, Detlef Mertins, passed away on January 13, 2011, at the age of 56. SOM Journal 7 was dedicated in his memory.